Last night I went to see the film adaptation of Markus Zusak’s The Book Thief and I loved it. Granted it took me about an hour to stop crying, but I really liked it and was impressed at how true to the book it remained. I’m usually the first person to cry foul if someone has messed around with a book I liked, and despite one major niggle I thought it was a fairly faithful adaptation. My thoughts below, but be warned, there are spoilers. A huge number of film critics have slammed The Book Thief movie, criticising what is seen as mawkish sentimentalism, an insufficiently harrowing representation of the horrors of World War 2, using Death personified as a narrator and criticising the fact that the cast speak with German accents in a mixture of English with the odd bit of German thrown in. To all of which I say, okay, but did you read the book? The New Yorker Review went as far as to cast doubt on the plausability of the street being bombed… to which I refer you to history books about the allied bombings of Stuttgart. Anyone who wishes to try to reduce WW2 to all Germans bad all Allies good may find their efforts hampered by some of the work of bomber command but I leave that up to GCSE History teachers to explain. It may be fair enough to criticise the film as being Oscar bait, but honestly, considering that it is an adaptation of what is ultimately a book for younger teenagers which found success as a cross over novel, exactly how harrowing do you think it’s appropriate to be? There were some fairly violent scenes depicting Kristallnacht with hauntingly beautiful music sung by a Hitler Youth choir, hauntingly beautiful until you read the translation of the lyrics and realise that it’s another example of Nazi propaganda designed to indoctrinate very young children into striving for the Aryan state from a very young age. I actually found it incredibly effective at looking at the war from a child’s perspective. Liesel (played brilliantly by Sophie Nélisse) is aware that people who are members of groups that Hitler disapproves of disappear. Her communist parents have disappeared one by one, and though she isn’t aware of the horrors of the concentration camps, she loves her friend Max and fears for what has become of him. I thought the scene where a group of Jewish men were being marched through the town and Liesel runs among them looking for Max was actually more convincing in the film than in the book. In the book, she finds Max and they are both beaten. You can imagine that worse might have happened to Max if this really happens. In the film, she doesn’t find Max in the crowd, every man she sees could be him, and she runs through them promising that she will not forget until she is beaten by a Nazi officer. There are critics who have poured scorn on the moderate actions such as these that individual characters take to code that they are “good Germans”, but the film very clearly demonstrates the real world consequences that actions like these would have had at the time- a family on the verge of poverty because the father refuses to become a member of the Nazi party, conscription to the army if you showed sympathy towards the plight of a neighbour considered “undesirable”, the risk that you yourself will be considered undesirable and taken away. It’s easy to say that the characters should have done more, but I wonder if many who watch the film will think the same as I did- would I be brave enough to do that? Do I oppose injustice in my far safer world? He lay in bed with one of his sisters. She must have kicked him or muscled her way into the majority of the bed space because he was on the very edge with his arm around her. The boy slept. His candlelit hair ignited the bed, and I picked both him and Bettina up with their souls still in the blanket. If nothing else, they died fast and they were warm. The boy from the plane, I thought. The one with the teddy bear. Where was Rudy’s comfort? Where was someone to alleviate this robbery of his life? Who was there to soothe him as life’s rug was snatched from under his sleeping feet. And I am not too great at that sort of comforting thing, especially when my hands are cold and the bed is warm. I carried him softly through the broken street, with one salty eye and a heavy, deathly heart. With him, I tried a little harder. I watched the contents of his soul for a moment and saw a black-painted boy calling the name of Jesse Owens as he ran through imaginary tape. I saw him hip-deep in some icy water, chasing a book, and I saw a boy lying in bed, imagining how a kiss would taste from his glorious next-door neighbour. He did something to me, that boy. Every time. It’s only his detriment. He steps on my heart. He makes me cry. In the film adaptation he stays alive long enough to half tell Liesel he loves her before dying in front of her. That annoyed me because it felt like a “film moment”, a betrayal of the book for no real narrative reason. It was a crude attempt to tug the heartstrings and the film would have been better without it. It was like someone had spent a bit too long in the fan fiction forums. In spite of that, I really think it was a good adaptation of The Book Thief. If you enjoyed the book, I think there’s a very good chance that you will like the film, though it’s not as good (these things rarely are) it’s by far one of the better film to book adaptations I’ve seen and the younger cast member are enchanting. This entry was posted in Uncategorized and tagged books, entertainment, film, History on March 16, 2014 by Siobhan. Set in 1663, twelve years after the end of the English Civil War, An Instance of The Fingerpost by Iain Pears is a bitingly clever murder mystery set in the streets and colleges of restoration Oxford. Narrated by four narrators, the reader is left to piece together the true course of events from highly unreliable narratives before discovering “the truth” in a final narrative which leaves you, despite your better judgement, unable to question the credibility of the self-proclaimed “objective” narrator. This is simultaneously the most intelligent and most enjoyable novel that I’ve read in a very long time. It’s clearly been immaculately researched, but at no point do you feel as though you’re having a lecture on life in post-Civil War Oxford. What particularly impressed me was the way that historical characters are seamlessly woven with fictional players (in reality, most of the characters are historical characters, though the events of the novel are fictional) and familiar figures from history like John Locke and Robert Boyle drift in and out of the novel as minor players, their genius and personalities noted as incidentals in the more pressing stories the characters are telling. I admit, that part of my fondness for this novel was the Oxford setting. The descriptions of areas that are now fairly gentrified within the city centre as filthy, run down hovels was amusing, but I especially enjoyed the description of a religious meeting in a warehouse on the quay at Abingdon (a hotbed of radicalism, apparently). I’m almost certain I know where the building the author describes must be. If you’ve ever spent any significant time in Oxford, or are planning a little sightseeing, this is a wonderful read and one which will truly stand the test of time. This entry was posted in Book Reviews and tagged book review, books, History, Oxford on February 20, 2014 by Siobhan. 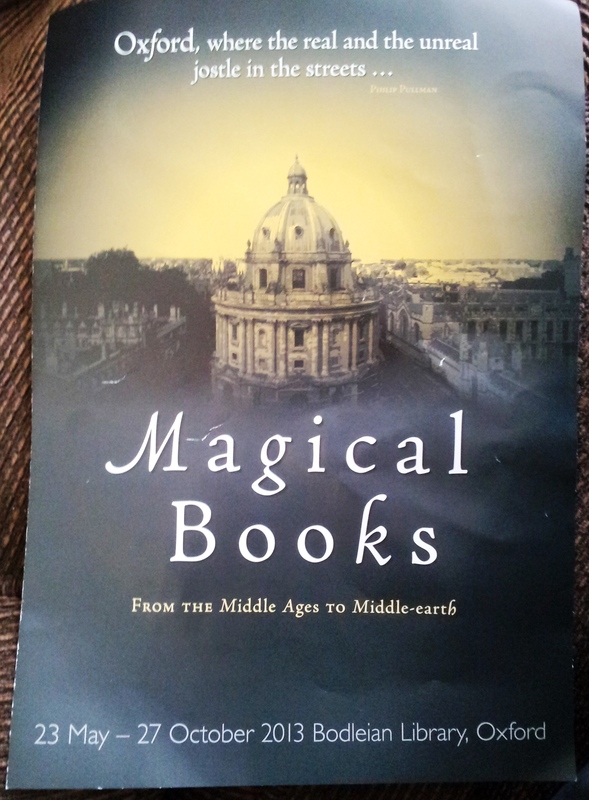 Yesterday afternoon I took a detour while shopping in Oxford to drop into The Bodleian Library’s exhibition of Magical Books. As with any Bodleian library exhibition, this did not disappoint. It was so exciting to see hand written manuscripts, art work and artefacts that some of my favourite writers created or were inspired by. Along with the usual suspects like C.S. Lewis, JRR Tolkein and Philip Pullman who you would expect to see at an Oxford based exhibition of fantasy literature, there were some real gems that I hadn’t expected to see like medieval manuscripts on divination, the Rawlinson necromantic manuscript and, my personal favourite, the plates which inspired Alan Garner’s The Owl Service. We read The Owl Service when I started secondary school and I can remember how I used to get told off for reading ahead in lessons when we were meant to be reading along with the class. It’s the first time I’d really appreciated that a story was updating and twisting an ancient myth into something new and modern (even though the book was at least 30 years old by the time I read it). I think that this is where my love of fairy tale and myth inspired novels has come from so it was really nice to be able to trace out the flower owls like Alison did in the story. Unfortunately, I’m not able to share any pictures from the exhibition here, but the lovely people at the Bodleian have made the entire exhibition available online for anyone who wasn’t able to make it to Oxford to see it. This entry was posted in Uncategorized and tagged books, events, History, magic, Oxford, travel on August 18, 2013 by Siobhan. 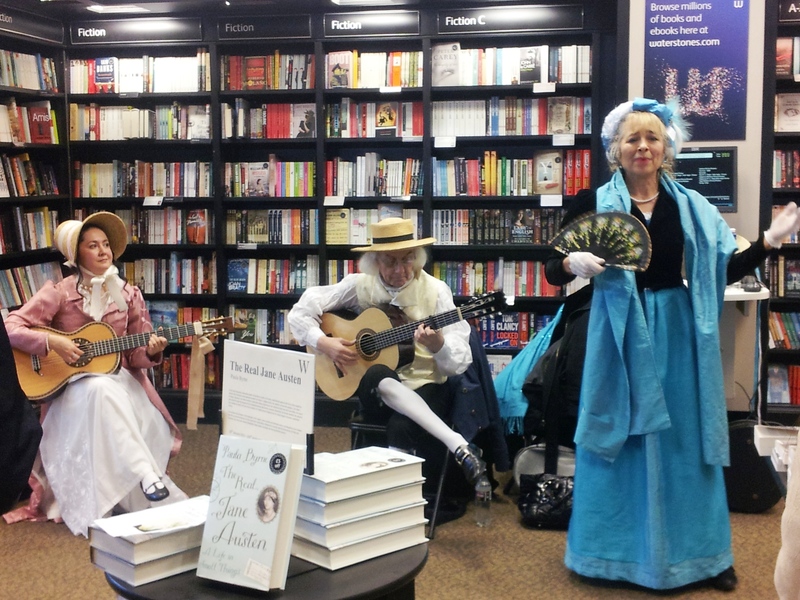 On Saturday I went into Waterstones, Oxford and found myself in the middle of a Regency style musical performance. I was a little annoyed that the crowd which had formed around the performers meant that I could get nowhere near the fiction books I’d planned to spend half an hour browsing, but when I heard Austentation (there to mark 200th anniversary of Pride and Prejudice being published) performing Greensleeves– which is one of my favourite folk songs- I quickly forgave the disruption! No chance of getting at those books without the right costume! This entry was posted in Uncategorized and tagged books, entertainment, History, Jane Austen, music, Oxford, Regency, Waterstones on January 28, 2013 by Siobhan. Ten Weeks in Africa- What would you sacrifice to do the right thing? When Ed Caine, an NGO worker employed by the Global Justice Alliance moves his wife and young child to Africa to improve living conditions in the Makera slum, he genuinely believes he can make a difference, but in ten short weeks his ideals are shattered. Despite the assistance of Beatrice Kamunda and her father Joseph Kamunda, a senior government official known for his principled stance against corruption, he finds himself stonewalled as funds are siphoned off by the government. As Ed and his friends try struggle to save their project, they begin to realise that they a powerful enemy is behind the land grab. As political tensions seethe pushing the country to the brink of civil war, Ed and Beatrice begin to understand that much more than the survival of the project is at stake. For anyone who remembers the outcry that arose when it was revealed that millions of pounds of Western Aid (including funds from Live Aid) was used by rebel leaders to buy arms, Ten Weeks in Africa by JM Shaw is an interesting read. It is well written with a fast paced and engaging story, but more than this it poses some interesting questions about Western interference in Africa. Through careful characterisation and plotting, Shaw creates a brilliant tension which gives birth to a pointed question: does financial aid from rich countries exacerbate the problems it is intended to solve? Though I am interested in politics and global justice, I can’t make any claims to be an expert, so I did some research about what the experts actually thought about it and the consensus seems to be that it is a well-researched, accurate representation of the concerns of people working in this area. For more information I recommend this article by Peter Gill for The Guardian and this article by Charles Moore for The Telegraph. This entry was posted in Book Reviews and tagged Africa, aid work, books, charity, corruption, entertainment, global justice, History, JM Shaw, Live Aid, Live Aid Scandal, NGO, politics, travel on December 27, 2012 by Siobhan.